Steve has big goals for 2017. His first full marathon is on the horizon with the Carmel Marathon in Carmel, Indiana on April 22, 2017! It's been an exciting journey for Steve since he first started running in 2009 to try to stay in shape. One thing led to another and without a conscious effort, he was hooked. Steve's first race ever was the Sunburst Half Marathon in 2010. Since then he has found the joy in running not just for fitness but in running for a cause and improving himself by challenging personal records. Steve normally runs in the late afternoons and some mornings on Tuesdays, Wednesdays, Fridays, and Sundays roughly 15-20 miles a week. Steve cross trains with core and leg exercises as well as yoga and weight training. You might see him running the path from Goshen College to Waterford School via 9th St or lapping the Goshen College Track. Sometimes he will run from his front door to the Pumpkinvine Nature Trail or Millrace Canal Trail if the weather is nice. Steve is looking forward to getting to know more of the 2RRC members, summer Reith Runs, and training at any group workouts at the Goshen College track. His quirky habit is taking walk breaks at mile markers in a half marathon and his favorite fuel is 2nd Surge gels and Nuun tablets. Steve's longest run ever is 18 miles and he's committed to his Hoka running shoes. 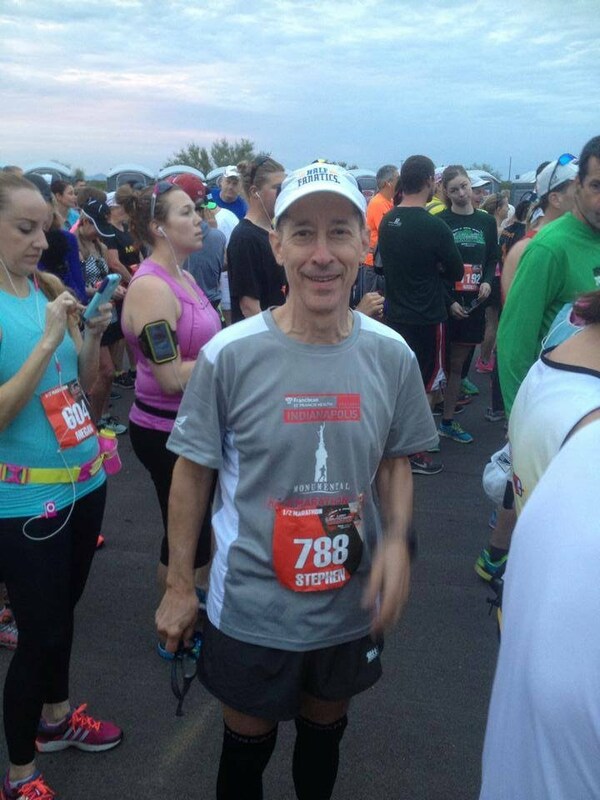 The best race Steve ever ran was the Disney Half in 2012 with his daughter and his fastest race was the Indianapolis Monumental Half Marathon just last November. The most interesting thing he has seen on a training run is "Jake Gillette on the Pumpkinvine going by at roughly the speed of light!" Welcome back to the club, Steve! We're glad to have you.